1. The village is the home of poverty, while the city is the place of wealth and good life. 2. The village is the home of witches and wizards while the city is the home of good men and women. 3. The traditional religion in the village is evil but the Christian religion in the city is the good that always overcomes the darkness in the village. 4. The village is a lawless society where one man can seize the property of anybody, especially widows, with nobody stopping him except by divine intervention, while the city is the land of order. In addition, anytime traditional practices are depicted in Nigerian films, they are shown to be evil. At the end, a pastor will be invited to destroy the “forces of darkness”. Ironically, in the real world, a Christian or Muslim would gladly accept to swear by the bible or Quran rather than any Nigerian deity because he believes that if he is guilty, swearing by the bible or Quran will not kill or destroy him, but not the same with swearing by a deity. The point is not that there are no evil activities in the rural areas. 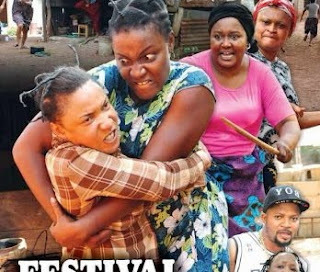 But for the sake of selling movies, Nollywood producers have continued on a campaign of exaggeration of the ills of rural lives and the glorification of Western life. In the eyes of Nigerians and foreigners, they have also put a question mark on the heads of Nigerian rich men as men of the occult who make their money through sacrificing human beings. Many poor or struggling people within Nigeria believe these stories, and start seeking ways to get rich, thereby leading to the disappearance of people, who are kidnapped and killed. I disagree strongly, because Nollywood is telling us what is going on around us. Hollywood is also telling us about America; drug crimes, police corruption, failed marriages and so on. Hollywood, does portray America as a country where everything is available and easy to get,but the reverse is the case. Police are portrayed as honest and political class are seen as good people,but that is far from reality. Every damn thing that occur in Nigeria also happens In America, remember that the devil is the king of this world so expect his handwork is simultaneously present everywhere on this planet. Everything you see on Nollywood, is a message on cautious life that everyone should live ke! WHAT IS D MEANING OF DIS MEANINGLESS EPISODE ???? ONE MAN,S MEAT IS ANODA,S POISON . SOME OF US CAN ONLY BUY FILMS LIKE DIS . A MOVIE IS SUPPOSE TO POTRAY D ENVIRONMENT . WHY TOO MUCH FAKES . THESE ARE ONE OF D REASONS WHY I SPEND 70% OF MY HOME VIDEO POCKET MONEY ON YORUBA MOVIES EVEN IF I CANT UNDERSTAND ND SPEAK , BUT I BUY D SUBTITLED ONES ALONE . D OODUA MOVIES ARE TOO DOWN TO EARTH !!!. WE ARE CRYING THAT YOU FAKE UP ALOT , NOW D MORE ORIGINAL ONES TOO YOU WANT TO CANCEL. IF YOU REFINE FINISH , WHO WAN BUY THEM .PRODUCERS OF LEKKI WIVES , ABEG WE ATRE WAITING FOR MORE EEEEE. EVERY PARTAKER OF THAT AWARD WINNING MOVIE IS DIVINELY TALENTED !!! TONTO DIKEH ND QUEEN NWOKOYE MAKE UNA FIGHT WELLA. MRS OKARO -CODED TROUBLE MAKER . AM GOING FOR DIS MOVIE RIGHT AWAY. True, but i often feel that the scenes where widows are tortured brutally are often exaggerated, this is often done to ignite strong emotions and trigger one to shedding tears, there by portraying lies, we often forget that these movies tell stories and the outside world tends to judge us from the obvious, that is to say from what we portray on screen. i often ask, aren’t we tired of acting the same plots over and over, don’t we think we need our script writers to go back home, take some brakes and then make good researches and come out with good ideas, it is also obvious that our book sector does better than the movie sector, so why cant we employ good authors to write us something good which we could put on screen for the world to see. Nigeria is way too civilized to be acting villages and shrines, when there are a lot of untold stories of the this present day. I think that Iroko TV has realized that.